- Beware when destroying the GLA Bio Weapon Factory, because any nearby infantry and light vehicle will be killed and destroy. - Beware of enemies toxin tractors, because even your troops inside buildings or bunkers, it will be annihilated by the toxic. - At the beginning of the mission, move your troops faster inside the bunker and Civilian Tower, as the enemies will soon be approach your base. Move your Tanks guarding the bunker. Also, you can use Black Lotus to hijack enemy vehicles. Defend the area until the Dam is destroy. - Prepare your defense near the river at the upper right, because as soon as the water drop, the enemies will advance from there. - If you learn Cluster Mines from General skills, you can place the mines near the Civilian building at the upper right, because the enemies will advance from that direction. - Learn Artilerry Barrage 1, Emergency Repair, Cluster Mine and Nuke Cannon skills. - Use Dragon Tank to guard the left road from incoming Angry Mobs. Use FireWall ability to eliminate all the incoming enemies. - At the first of the beginning of the missions, beware of continuesly incoming enemies. Upgrade your Overlord into Bunker and Propaganda Tower. Then Fill your Overlord bunker with any remaining Tank Hunter. Position your Overlords in the front and all the rest vehicles behind. Position your Inferno Cannon to Guardian state behind your Overlords Tank. This will make your Overlord as the fortress, while the Inferno Cannon bombarding the enemies from behind. - At the same time, you must build Nuclear Reactor and Barracks to produce Tank Hunter. Then fill any available Overlord Bunker with Tank Hunter. After that you can create Command Center. 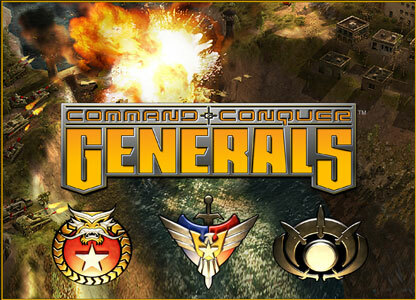 - Upgrade your General's skill with Cluster Mines first, then if available, you can drop mines to slow down the enemies. - Capture the nearby enemies building, which is GLA Barracks, GLA Arms Dealer and GLA Supply Stash. Then place your Overlords Tank at the top of nearby hills road at north of the GLA Supply Stash building, and the same thing with your Inferno Cannon. You can also build Gattling Cannon there. - If you've enough money, then start build Supply Center, War Factory, Propaganda Center and then create Hackers to generate more income for you. 5. You can destroy a group of enemies Battlemaster tanks at the bottom right of your base by using Bom Truck. Use camouflage as one of the Battle master tanks then move your bomb truck near the group and detonate the bomb. 8. Despite straight to destoy the Dams, you can eliminate any available enemies in this mission first. 10. Fill the Civilian buildings near the bridge and dock with your RPG Troopers, and then you can do hit and run tactics for enemy Tanks Group at the next island. When they chase you, just retreat to your main land and watch your RPG Troopers destroy the enemies Tanks that chasing you. 3. Destroy the American soldiers that occupied the Airport using your Toxin Tractors. - Create Palace (in front of your defenses, and fill it with Rocket Launcher), then learn Camouflage to hidden your troops. It's perfect for ambush. After that you can create Jarmen Kell to kill any Chinese Vehicle driver and capture their vehicles. - In this mission, you'll fight Chinese and American forces with full technology, which is they have Nuclear Missiles and Ion Cannon. If you've capture them, you can use it for your own good. 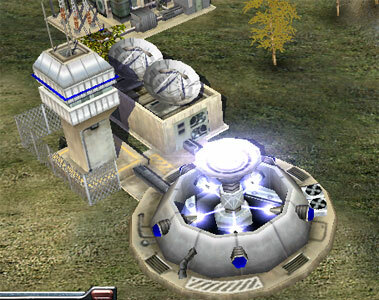 Primary target for your mission would be to destroy their Nuclear Missiles and Ion Cannon buildings. 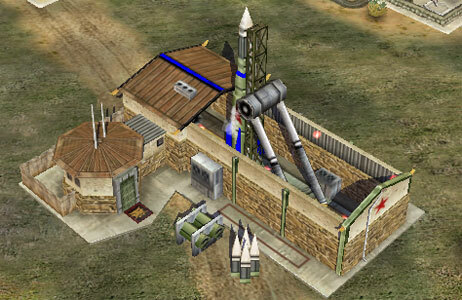 - The American Ion Cannon is located at the right top of the American Strategy Center. 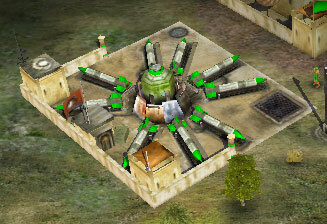 Use Anthrax Bom at the Strategy Center to open the surrounded area. Then if the toxin has been faded, drop your Rebel Ambush to destroy the American Ion Cannon. - The Chinese Nuclear Missiles is located around the area at the top left from your base. - You must build your defenses at the 3 narrow road. Also you can place Jarmen Kell at one of the Civilian Building, so he can kill any soldiers that coming. You can place him at the left narrow road. At the center narrow road, you can place your Palace and fill it with your RPG Troopers to stop enemies vehicles. - Upgrade your Marauder Tanks with Toxin Shells, so they can kill any enemies soldier fast. And don't forget to get any vehicles debris, so your Marauder Tank can upgrade their weapons. 1. Create 5 Humvee and 1 Ambulance. Then bring all your forces crossing the bridge and eliminate all the GLA units. 2. Wait before the enemy completed build Barracks, Stash and Arms Dealer Building, then try to capture all GLA buildings except their Command Center. 3. At the side where the GLA Command Center are, build American War Factory, American Barracks and American Supply Center. Then at the front line, build your GLA Network Tunnels and GLA Stinger Sites. Do not build Patriot Missiles at this time, because when the enemy SCUD Storm attack, your GLA building still can re-construct after destroyed. At the other side, you can construct American AirField, American Strategy Center and American Detention Camp. 4. Upgrade all your buildings. 5. Build Raptors and Tomahawk. 7. Save at least 5000 gold, then you can capture the enemy GLA Command Center. After that, the GLA forces will destroy the dam, and you'll separate from the 1st base. But don't worry, your 1st base is safe, because the GLA can't approach it. Concentrate to build your next base. 8. Build your GLA Palace at the right side of your base to guard from enemies approach from that directions. Then fill it with Jarmen Kell and RPG Troopers. After that you can create your own SCUD Storms. - Enemy SCUD Storm is located at bottom left corner of the screen.